Revisiting the west coat. In fact, revisiting a site that I posted photos for back in January because that is what we did, and we discovered the more interesting parts. So this is the lookout that I showed last time. 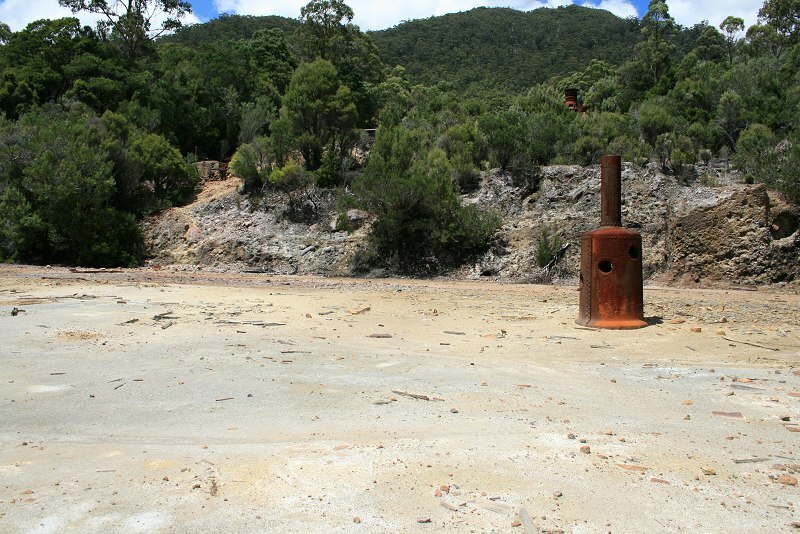 The area was the site of a processing plant operated by the Tasmanian Metal Extraction Company (TME) in 1913/1914. 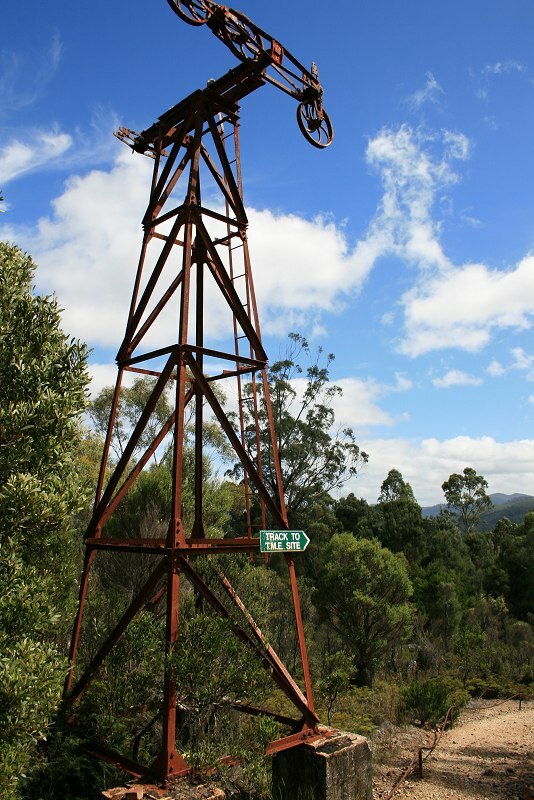 This lookout is just off the Williamsford Road, and gives you a view over the site, but there's no access down to it. However, if you leave turn off the main path just before the lookout and go around to the right and then around to the left, you eventually end up on the area below the lookout. Just outside Rosebery this is a dirt road that runs off the south. There are number of signs at the turn off that point to "Williamsford 6 km", "Car Park 6 km", Montezuma Falls. About one kilometre in though is a small car park and tower. Been meaning to post these for ages but I keep putting it off. Nothing exciting here, so feel free to skip unless you're really curious what the above it, don't want to go to Branxholm or are interested in Chinese miners. Zeehan, the silver city. This is somewhere I'd like to go back to one day to get some better photos. In the 1880s, silver and lead deposits were discovered and the town grew, quickly. One book I have tells me the population in 1908 was 10,000. Other sources give similar figures. Do I sound surprised? Those other sources tell me that in 1900, Launceston's population was 18,000 and Hobart's was 25,000. That was one big town out on the far west coast, a city indeed. I'm going to continue the mining theme with some more mining towns, this time down the West Coast. 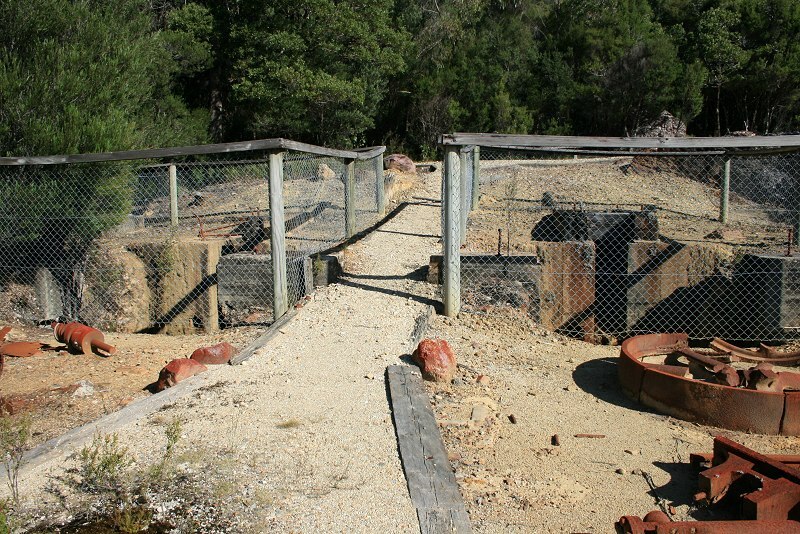 If you're not interested in mining towns, look away NOW. Right. I've included some of these in my West Coast trip report back in 2005, but that was years ago and there are some additional photos. Unfortunately, we only made a quick visits to these towns so I only have a small number of photos of sometimes dubious quality. The west coast is wild and remote, much more than you'd think from the map. It's all mountains and rain forest, winding roads and wild rivers, and some of the richest mineral deposits in the world. I was going to do some background & start with Zeehan, but I have photos of Rosebery already uploaded and it is the first town of substance you come to from the north. So I'll start there, and add in background details as the come up. Main street (Agnes St). The pub on the corner seems to have been done over. A story of gold, and what people will do to get it. Mostly though, it's a story of numbers. Early attempts at mining in the district were for iron, in the 1870s there were a number of small companies extracting iron. The quality wasn't sufficient to make it a viable long term proposition though. It's still there of course, and with modern methods, probably profitable but it doesn't have the same allure as that other metal.